*These directions may vary slightly on a stationary device. Click here for those directions. Step 1: Start at Track Wrestling's Home Page at www.trackwrestling.com. Step 2: Click on the "Hamburger Menu" on the left side of the page. Choose "Browse" from the drop-down menu. 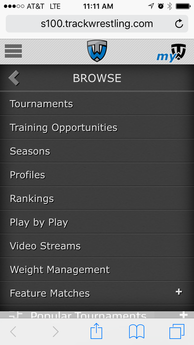 Step 3: From the "Browse" drop-down menu on the left, choose "tournaments"
Step 4: On some devices, you may have to click on the "Functions" link to be able to search events. Then, click on the "Search Events" button and type the name of the event you are looking for, then click "Search" at the bottom of the page. 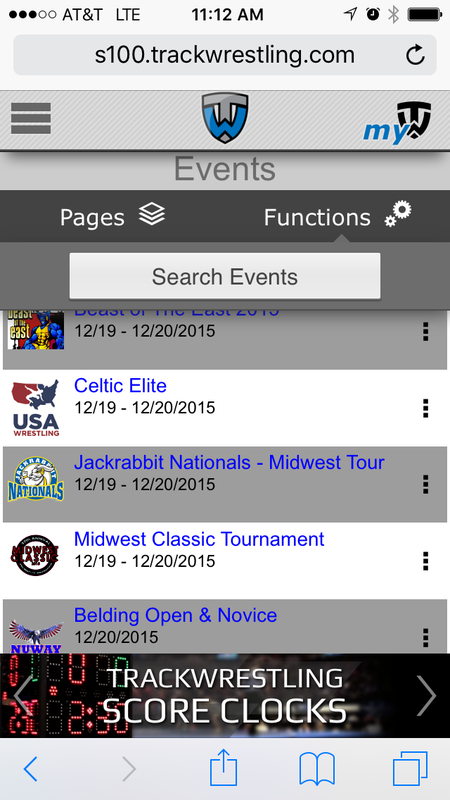 Step 5: Choose the tournament you are looking for by clicking on it. Be sure you choose the correct year. Click on "Enter Event" in the pop-up window. Step 6: Now, choose the division and weight you want to view a bracket for on the left side in the drop down menus. Step 7: You can now view the most up-to-date version of the bracket.